Gunmen believed to be Fulani herdsmen have killed scores of villagers in Benue State in a long-running conflict over grazing rights, the state government said on Monday. “The magnitude of killings is enormous. 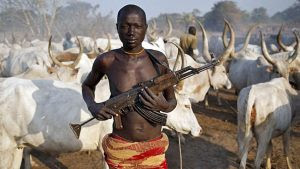 Scores of people were killed in the past two weeks by Fulani herdsmen in at least 10 local government areas of the state,” spokesman Tahav Agerzua told AFP. The state government was collaborating with security agencies to contain the violence, which is the latest flare-up between local farmers and the herders in the state. Benue state police spokesman Moses Yamu confirmed the killings but said the affected communities had returned to normal. “It’s not a recent development. The clashes happened last month and we are on top of the situation,” he said. Nigeria’s Channels television put the number of dead at 81 in the past two weeks after attacks on farming villages in the Logo and Ukum areas of the state. The mainly Muslim Fulani herders and largely Christian farmers have clashed for decades over increasingly scarce land and resources, particularly in the religiously mixed central states. In February, hundreds of people were said to have been killed and about 1,000 homes destroyed in the Agatu area of Benue in a wave of attacks blamed on Fulani. Those attacks appeared to be in revenge for the death of a Fulani leader and the theft of his cattle, which was blamed on the Agatu people. President Muhammadu Buhari, northern Muslim, has proposed the creation of grazing land to prevent further clashes but Fulani groups say in Benue the government has opposed the plan. The violence is the latest security headache for Nigeria, which has been battling Boko Haram Islamists in the northeast for the last seven years and a flare-up of militancy in the oil-producing south.